Evaluate the accuracy of your pipettes in seconds with our convenient Pipette Checkit® cartridges. Low-cost, fast, and easy to use, the Checkit can save money on calibration services while giving you the confidence that your pipettes are delivering accurate volumes. No more trying to read a tiny droplet’s weight on a high-precision balance. Many pipette manufacturers recommend regular in-laboratory checking of pipettes in addition to good maintenance and scheduled calibration. The Checkit provides a valuable early-warning system for a pipette that may be drifting out of calibration. Keep Checkits in the lab for instant confirmation of pipette accuracy. Especially useful if your pipette has been dropped, cleaned, or borrowed. Don’t take a chance when you’re setting up an experiment with precious samples or expensive reagents. Perform checks regularly to watch for performance drift – get early warning before there’s a problem. Good pipetting technique is an important part of laboratory success. Use the Checkit as a training tool to verify proper technique. The Checkit requires no special training and is easy to use even for novice lab members. How quickly should the tabs be lifted up? To minimize evaporation losses, lift each tab immediately after dispensing dye into its well. Lift the tab at a comfortable rate. How hard do I need to push on the tab? How far? A light touch is all that is needed to lift the tab, until you feel it stop moving. Do not push hard, or the plastic parts will distort and the glass capillary will break. Leaving the tab up will reduce evaporation, thereby providing you more time to compare the meniscus to the adjacent markings. When dispensing into the well, if you do a blowout, first lift the end of the pipette tip out of the pool of dye in the well. How accurate is the Checkit? It is about 1% accurate, aside from external influences such as evaporation. What is the cross-hatched rectangle? ISO 8655 standard covers the accuracy requirements of hand held, single channel, adjustable pipettes. The rectangle illustrates the acceptable range. Note that the width of the ISO rectangles does not factor in the 1% accuracy of the pipette Checkit®. What are the horizontal lines under some of the tick markings? The horizontal lines represent the approximate accuracy of the Checkits. Thus, if the readings indicate that the dispensed volume was 3% low, and the horizontal lines indicate 1% accuracy, the actual dispensed volume might be only 2% low, or it might be up to 4% low. 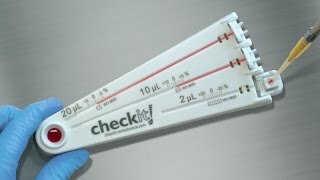 Can the Checkits be used to test someone’s pipetting technique? Yes, one good application of the Checkits is testing the accuracy of a person’s pipetting technique. Can the Checkits be re-used? No, the Checkits are designed to be disposable. Can I replace the glass capillaries? No. To ensure accurate readings, the capillaries are precisely positioned to within .001 to .002 inches (25 to 50 micrometers). It would be near impossible to refill the Checkit with such accuracy. In what order should I test my pipette at the high, middle, and low end of its range? We suggest that you test the high end of the range first, then the middle, and finally the low end. For example, with a C20 Checkit, first test it for 20 uL, then for 10 uL, and finally for 2uL. Can I use the checkit outdoors? For accurate readings, the Checkit must be on a level surface, near room temperature. It will not be affected by altitude, humidity, or small changes in temperature. Is the Checkit’s performance effected by changes in temperature? Temperature should not have a significant effect on the Checkit between 4-40°C and its readings change less than 0.07% with a 10°C change. The evaporation effects are minimal once the droplet is in the glass capillaries in the Checkit. Thus making it more accurate than a scale. While the density of the water changes (and so the observed mass for a given volume) between 4-40°C, the glass capillaries are not subject to much thermal expansion over this range. Therefore, the volume should stay very close to accurate between these temperatures. Since the Checkit measures pipette volume with volume, there is no conversion of units like with a scale (from mg -> mL). Given the volume on the Checkit is read in the same experimental environment of your pipette, it is a more accurate reflection of how your pipette performs. This is an advantage of the Checkit over classical methods. How do I dispose of the dye? The dye is safe and non-toxic. It can be disposed down a sink drain. 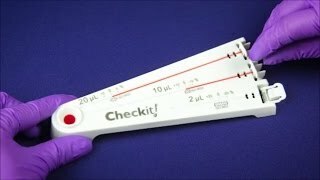 Instructions on how to use the Pipette Checkit in PDF format. The Pipette Checkit® is a tool to identify potential volume delivery errors for pipettes. It is not a calibration tool. If your institution requires pipette calibration on a specific schedule, you should adhere to this schedule and use the Checkit as an extra verification step between scheduled calibrations. Piston pipettes are most accurate at or near their nominal volume (the maximum volume the pipette can deliver). When a pipette is used near the bottom of its range, the measured volumes will vary more, and are also more strongly affected by slight variations in pipetting style or environmental factors like humidity. The markings on the Checkit reflect this variation. A note on environment: One advantage of the Checkit is that it can be used in the same room in which the experiment will be conducted. This can help identify variation in delivered volume due to pressure, humidity, or temperature differences between the calibration environment and the experimental environment. Because the Checkit directly measures delivered volume rather than relying on gravimetric analysis, there is also no need to use correction calculations that account for these factors. Most pipette manufacturers provide specifications for both the accuracy and precision of their pipettes. Briefly, accuracy describes how close the mean of delivered volumes is to the stated volume, and precision describes the distribution of the volumes around the mean. If you choose to compare your Checkit readings to the manufacturer’s specifications, remember to account for both accuracy and precision when determining what range is acceptable. Note that ISO 8655 standards differ from the manufacturer’s standards. If your pipette has been recalibrated since purchase, you should check with your calibration service to determine which standards were used, and consider comparing your Checkit readings to that standard rather than to the manufacturer’s standard. † Lead time for this non-stock item is approximately 24 days.